Looking for and not finding many "-kaures". I notice that there appear to be two Sekhemkares, though-- Amenemnat Sonbef and Amenemhat V. It would be rather irregular for a throne name to be repeated that quickly, especially within a dynasty. Any chance one of them was a Sekhemkaure instead? ... There is a debate between egyptologists on whether or not Sekhemkare Sonbef is the same king as Sekhemkare Amenemhat V, 4th ruler of the 13th dynasty. 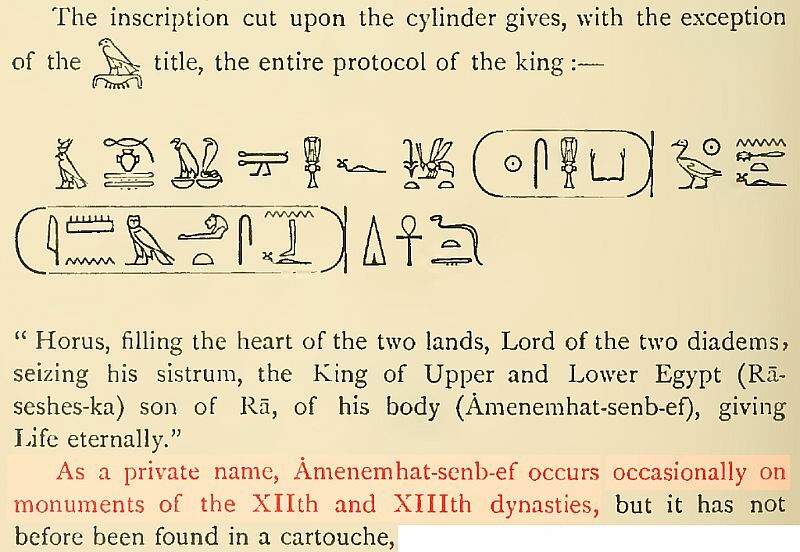 Indeed, Sonbef called himself "Amenemhat Sonbef"; this can be a double name, but can also be a filiation Son of Amenemhat Sonbef, which both Ryholt and Baker see as evidence that Sonbef was a son of Amenemhat IV and a brother of Sekhemre Khutawy Sobekhotep, the founder of the 13th dynasty. Thus, they see Sonbef and Amenemhat V as two different rulers, an opinion also shared by Jürgen von Beckerath. Ryholt and Baker further posit that Sonbef's and Amenemhat's rules were separated by the ephemeral reign of Nerikare, while von Beckerath believes it was Sekhemre Khutawy Pantjeny who reigned between the two. ... I personally tend rather to the conception of Quirke and Franke. Yes, I was just reading Quirke's "In the Name of the King: on Late Middle Kingdom Cylinders" (in Timelines: Studies in Honor of Manfred Bietak), in which he makes a good case against "filiative" naming. I had accepted the concept of filiative naming as a matter of course before that, but his reasoning does seem sound. If it is not only a double name, then one has to explain how there are several identical personal names in the non-royal realm? All with the same lineage as the king? Mn-kaw-Ra / Nfr-kaw-Ra / Nb-kaw-Ra / Ḫaj-kaw-Ra / Mrj-kaw-Ra (maybe not complete, from Hannig, Handwörterbuch I, 2006). Zur Frühgeschichte des Amun-Tempels von Karnak. - In: MDAIK 25. - 1969. - pp. 212 - 219. Aufbau und Zweckbestimmung der Königsliste von Karnak. - In: GM 9. - 1974. - pp. 41 - 48. While I can't be truly certain what's in or not in a partly-destroyed cartouche, it does not appear likely to be any of those, at least to me. Mn-kaw-Ra: From Sneferu's existence in place 2, a 4th-dynasty king cannot be ruled out. However, it is notable that there is no pre-12th dynasty king in any of the observable cartouches on the right side of the room; further, the earlier kings on the left side are grouped together (places 1-5, 9-13, 14-16) whereas ...-kaw-ra's neighbors are both Second Intermediate Period, so it would be reasonable to hypothesize that ...-kaw-ra is SIP as well. Nfr-kaw-Ra: 8th Dynasty, so doubtful for same reasons as Mn-kaw-Ra. 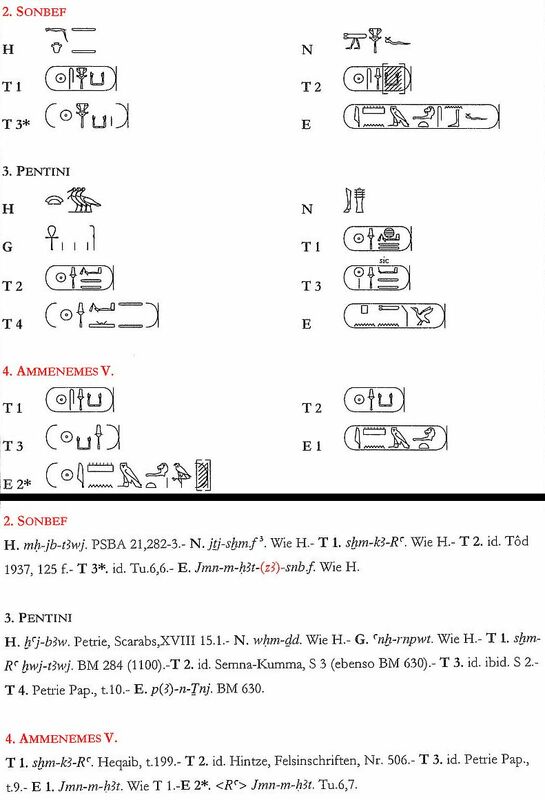 Mrj-kaw-Ra: Mr(j)-kaw-re (a Sobekhotep) is already listed in place 42. Thank you for the citations (Zur Frühgeschichte... and Aufbau und...); I will try to track them down. Nicolas Grimal : Les Ancêtres de Karnak. - In: Comptes Rendus des Séances de l'Académie des Inscriptions et Belles-Lettres 154(1). - 2010. - pp. 343 - 370. Élisabeth Delange : Trois monuments égyptiens du Nouvel Empire - La Chambre des Ancêtres, les Annales de Thoutmosis III et le décor de(s) palais de Séthi Ier. - Paris : Louvre Éd., 2015. - ISBN : 9782916142067. - 256 p., 700 ill. - Pages 17 - 114 : LA CHAMBRE DES ANCETRES DE THOUTMOSIS III. Élisabeth Delange : Trois monuments égyptiens du Nouvel Empire - La Chambre des Ancêtres, les Annales de Thoutmosis III et le décor de(s) palais de Séthi Ier. - Paris : Louvre Éd., 2015. - ISBN : 9782916142067. - 256 p., 700 ill. - Pages 17 - 114 : Marc Etienne - LA CHAMBRE DES ANCETRES DE THOUTMOSIS III. Nerts. Ich spreche (lese) kein Französisch! I'll hope for a translation as well.